This pizza is so affordable and yet so delicious. Every time we have a cheat day at home this is our go to pizza to make at home. It's so incredibly yummy and my whole family loves it. I will always continue to buy this pizza and the ingredients are perfect. Delta is a great company to fly with. I've never encountered any problems with my trip or my bags. They are excellent when it comes to costumer service. I fly often and they are one of my go tos for my trips. JetBlue is a great company to fly with. They have always been on time and I've never had any complications with any of my trips. I fly a lot and I try to use jet blue when it's available. They are great customer service. I love flying with south west for multiple reasons. My main reason is that luggage is free and that they also have free TV on the flight for my daughter to watch Disney movies. Their customer service is great and I am actually going on a trip soon and I am flying with them. I highly recommend them for your flying needs. I purchased a Neverfull MM purse and I absolutely love it. I try not to get it dirty because it's my precious purse that I have. I got it last year as my birthday gift to myself. The purse is pricy but who doesn't love a LV bag. The name speaks for itself and I would love another bag in the future. I loveeeeeeeee Kit Kat, by far one of my favorite candy bars. I usually buy it at Walmart or any grocery store near me. The flavor is perfect and it's my go to when I want to snack and have a movie night. I absolutely love Milky Way and it's one of my go to snacks when I want to cheat on my diet. The flavor is just perfect with the caramel and chocolate. I only eat them once in a while because I try to be healthy but they are yummy and are good as a treat. 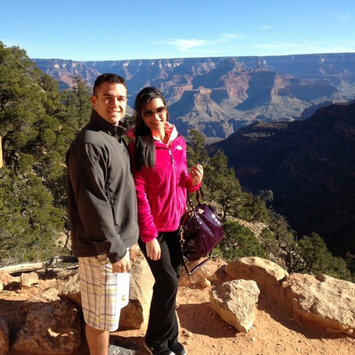 I went to the Grand Canyon last year with my husband and we loved it. We decided to walk through the different trails that are there. I would definitely recommend to pack some water and snacks if you decide to do a long trail like we did. It's a great exercise and you get to enjoy the lovely view. I would love to go back and do it all over again.